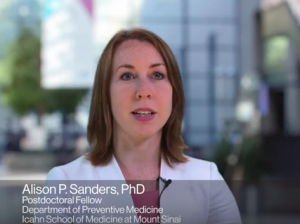 We are excited to launch our first Emerging Science video, highlighting Dr. Alison P. Sanders’ recent work on epigenetics, prenatal exposures, and preterm birth. A press release describing this research is available here, and you can find two publications on PubMed here and here. Dr. Sanders is a postdoctoral fellow in the Department of Preventive Medicine, and a trainee in our NIEHS P30 Center. In addition to her research in The Senator Frank R. Lautenberg Environmental Health Sciences Laboratory, Dr. Sanders leads several education initiatives, including The Future Leaders in Science Education and Communication Training Program and an afterschool science program for East Harlem fifth graders at the Boys & Girls Harbor. This entry was posted in Feature of the Month on August 3, 2016 by mountsinaitceee.